Las Vegas is a destination that offers something for everyone. Whether you are taking a family vacation, business trip or just trying to get away, Sixt rent a car has great car rental deals for every occasion. Our vehicle fleet consists of a large selection of premium vehicles in both economy and luxury models from some of the best manufacturers in the world. Find the vehicle that fits your travel plans and budget from our large selection of top quality compact cars and sedans, exotic cars and convertibles, and full-size SUVs and minivans too. For an easier and more convenient car rental experience, be sure to download the Sixt App, which has been designed to add an extra layer of intuitiveness and customization. Our McCarran International Airport car rental services are located off site and can be quickly and easily reached 24 hours a day with our courtesy shuttle. 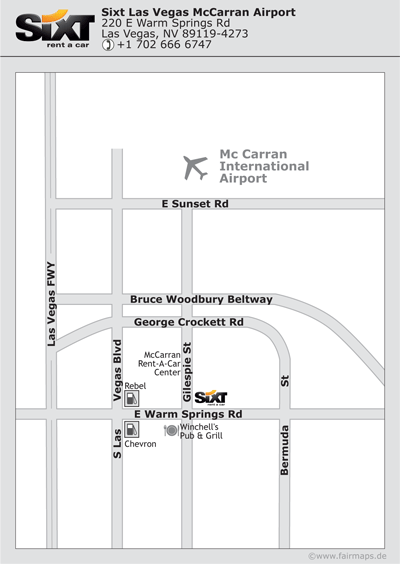 Upon arrival at the airport, please board the shuttle bus departing from outside the Baggage Claim area to the McCarran Intl Airport's Car Rental Center. Once at the car rental center, proceed to sign number 4 at the Taxi pick-up waiting area where our Sixt bus will be waiting to drop you off at our branch location just across the street. It runs 24 hours a day and can be viewed via our live shuttle tracker . At our branch, relax in our spacious lobby and refresh yourself with free coffee, tea and water offered by your rental agent. There are also great amenities on site, including a gas station for returning the tank full and a convenience store. Once behind the wheel of your rental car, the famous Strip is just a 10-minute drive away. What is the right vehicle for your trip? Our large selection of passenger van or minvan rentals are perfect for a family vacation. An van rental from Sixt allows large groups to travel quickly and easily in comfort. Arrive at one of the numerous conventions held at the Las Vegas Convention Center in style with a full-size SUV. Large luxury vehicles are great for business travel groups. Sixt rent a car at McCarran Airport offers travelers a selection of exotic car rentals, including the Range Rover Sport, Mercedes E400 Convertible, and Mustang GT. You can make your trip to Las Vegas one of luxury by selecting from our large range of exotic cars from the world's top automotive manufacturers. Whether traveling for business or pleasure, Sixt allows you to make a lasting impression in one of our premium sedans. Drive in style to your destination by selecting a Cadillac or Mercedes-Benz to experience the Vegas luxury lifestyle. Sixt offers a large selection of convertible rental deals so that no matter where you travel in the Entertainment Capital of the World, you will be sure to arrive in style. If you're planning on exploring the awe inspiring natural beauty of the Grand Canyon, then you should read our Grand Canyon guide on our Sixt magazine for tips about how to drive there and whether to visit the North or South rim.